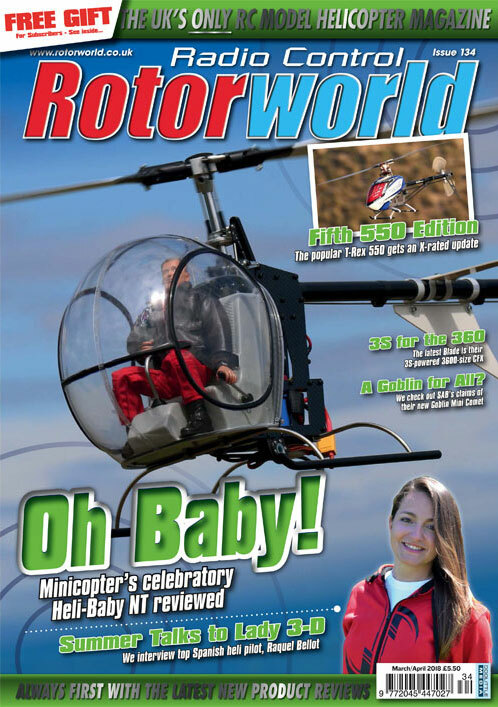 Minicopter Heli-Baby NT – Some 40 years on from the original Heli-Baby model, Minicopter has launched the New Technology version that pays tribute to Dieter Schlüter’s example, but with some modern-day updates. Align T-Rex 550X – More power, reduced weight, greater performance and many design changes highlight the latest incarnation of the T-Rex 550 model. Blade 360 CFX 3S – With a carbon fibre frame and blades, the latest Bind-N-Fly heli from Blade focuses on the intermediate pilot who wishes to step up into 3D aerobatics with the convenience of a pre-built, 3S-powered platform. Music City Helicopter Championships – Tim DiPeri reports from the annual Music City Helicopter Championships that takes place late in the season at Nashville in Tennessee. Talking Helis with the First Lady of 3D – Summer Fisher chats to world-class female 3D pilot Raquel Bellot to find out how she got started in RC helis and the dedication it takes to get to the top.